Traditional terraced cottage in quiet location 50 metres from High Street, with its alternative shops and many eating places. Sitting room with dining area leading to modern kitchen. Upstairs one pretty double bedroom with bath/shower. Small garden with outside furniture. Parking and heating included. The cottage also has WIFI for internet access. Use of tennis court by arrangement with owner. Carol Cottage is an end-of-terrace cottage with parking for two cars. Built of Cotswold stone with exposed timber beams. Situated in a quiet position and within 50 metres of the famous High street of Chipping Campden with its Jacobean Market Hall and 15th Century Church. Close to the Cotswold Way footpath and within easy reach of Stratford-upon-Avon, Cheltenham and Oxford. Ideally situated for walking, racing, gardens (i.e. Hidcote), Stratford Theatre, antique shops. Upstairs: Bathroom with Shower/Bath, W.C., Hand basin, 3 Bedrooms, 1 double, 1 twin, 1 single. Gas Central Heating and Electricity inclusive. There are a number of good restaurants and pubs that serve good food, shops for provisions (open all hours) all within a few minutes walk. Cowfair is tucked away in a quiet position in the picturesque village of Chipping Campden. This comfortable, detached, Cotswold stone cottage is just 300 metres from the village centre and its alternative shops and excellent pubs and eating houses. Close to the Cotswold Way footpath and within easy reach of Stratford-upon-Avon, Cheltenham and Oxford. Ideally situated for walking, racing, gardens (i.e. Hidcote), Stratford Theatre, antique shops. The cottage consists of entrance hall, large farmhouse style kitchen with a range of fitted units, fridge/freezer, microwave and eating area.. Utility room with washing machine cloakroom, W.C. Sitting room with electric log-effect wood burner and French windows opening out on to the terrace and private walled garden. Upstairs there is one king size double bedded room and one twin bedded room. One good sized bathroom with Shower/bath washbasin and wc . Lovely cottage with everything you could need and more. Very good position in the middle of Chipping Campden right on the Heart of England/Cotswold Way. Private parking which is a big bonus. Excellent walks from the door in all directions. Pubs very friendly and we particularly liked the Red Lion. Food at the Bakers Arms in Broad Campden very good. We had a lovely week thank you Jane and we would highly recommend Carol Cottage. Just what you want your holiday accommodation to be! A Lovely cottage a stone's throw from high street with assortment of shops and good places to eat. Beautiful countryside and great walks. Even found a sweet Chestnut tree and brought a load of Chestnuts home to roast. We enjoyed our stay at Noel Cottage. The location was absolutely perfect. We could easily walk to restaurants and shops . . . they were right on our doorstep. The cottage had everything we required, and was very comfortable. It was nice to find a place with a bath and laundry facilities, and the onsite parking was a big bonus. 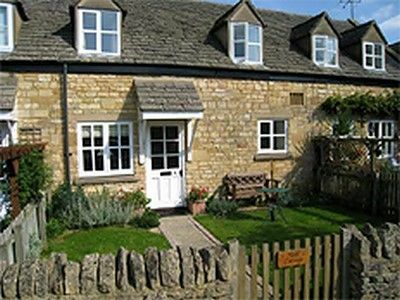 I would stay at Noel Cottage again if I was visiting Chipping Campden. Welcome to our beautiful town, Chipping Campden in the Cotswolds. Campden is one of the most beautiful tourist destinations in the UK. With easy road access, it is ideal for a full vacation or just a short break. The central, location in the North Cotswolds makes an ideal base for your accommodation for a touring holiday. Take a pictorial tour through these pages and get a taste of Olde Cotswold England - but if you really want to appreciate the feeling of staying in an old cotswold stone house in a town, hardly touched by the centuries, you'll just have to come and visit us. Due to its central location in the north Cotswolds, Campden is also a perfect place to stay with plentiful accommodation. You can enjoy the delights not only of this charming old wool merchants' town, but also the nearby surrounding shire counties of Oxfordshire, Worcestershire and Warwickshire. From Blenheim Palace and the Cotswolds to the south, to Worcester and the Malverns to the west plus Stratford-upon-Avon and Warwick (with the best medieval castle in Europe) all within an hour's journey. Noel Cottage: Low season: £285, High Season: £500 all inclusive Short Breaks are also available.